How long does it take to ship my products once I order them? If we receive your order before 1 p.m. CST, we will typically get it out within two business days. All orders after 1 p.m. CST will be counted toward the next business day. When our volume is high, it may take three business days before your products will ship. We typically ship all of our products via UPS. Our computer system is connected directly to theirs. UPS calculates their charges by weight and distance. All of the weights of our products are listed on our website. To estimate your shipping cost, you will first need to determine the total weight of the products that you are ordering. Then go to the UPS website, and click on Calculate Time & Cost. Our warehouse is located in Bemidji, Minnesota. The zip code is 56601. You can estimate the time of arrival for your products by going to the UPS website and clicking on Calculate Time & Cost. Once we confirm that your package has been shipped, we will email you a tracking number. Please note that this may come a day or two after you placed your order as we make sure all orders have been shipped before contacting our customers. Yes. Our handling fee is $1.95. Yes. We understand that UPS may not be the best shipping method of choice by our customers in Alaska or Hawaii. We will contact customers from these states via email to ask what method of shipping is preferred. We have found that USPS Priority mail generally is the method of choice. We will not ship until we have received confirmation from our customer. Yes we do. When we receive an order from Canada, we contact that customer via email to determine how they want their order shipped. We will offer suggestions as needed. It is important to note, that any import or duty charges that may occur are the responsibility of the customer as we have no way of determining these costs ahead of time. I am a solo canoeist/hiker/etc., are any of your products packaged in single serving sizes? 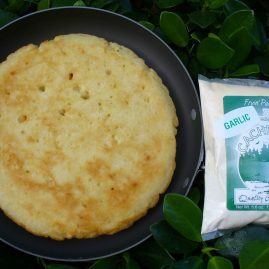 Note: Fryin’ Pan Bread™ is available in a two serving size package in the Overstock Outlet. One package will make a 4 1/2 oz. serving of bread. (That would be approximately 1/4 of a 1# loaf of bread.) 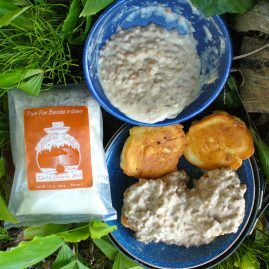 Any of the sweet breads including the Wild Rice Blueberry Pancakes, will have a packet of sweetner packaged separately to prevent it from clumping and becoming hard. This needs to be added to the dry ingredients. Once it is mixed into the rest of the dry mix, it is difficult to say how long it will remain free from clumping. Is there a separate shipping charge for backorders? Yes there is. However, we will contact you via email before shipping to give you the choice of waiting and having the complete order shipped or to have us ship the items in stock now and the rest later. We will give you an estimated time of arrival for the backordered item. We will also offer suggestions for substitutions for those items that are on backorder. I have allergies, how do I know that I’m not allergic to your products? View our list of common allergens or get more information via email or a phone call (1-800-442-0852). Adobe acrobat reader is required to view the documents. Get Acrobat Reader from Adobe, it’s free. Do you have any peanuts/nuts in your products? No we do not. However, our co-packer packages other products for other customers who do have nuts or peanuts in their products. They thoroughly clean and sterilize their equipment after packaging products that contain nuts. However, as unlikely as it is that there would be any nuts in our products, we cannot guarantee that they are 100% nut free. We have over 80 different products and the preparation directions will differ depending on the product. All products do have preparation directions on the package label. The cook times will vary depending on the product. Maximum cook time is 20 minutes (for products with wild rice). Minimum cook time is 0 minutes, no cooking required (Quick & Tasty line of products, such as puddings and quick lunch items such as Cheesy Sweet Potatoes, bean wrap fillings, wild rice salads). The majority of the Outfitter’s Choice entrees will cook in 8 – 12 minutes. Fryin’ Pan Breads will take 5 minutes (lunch/dinner breads) to 10 – 12 minutes (breakfast breads, scones and biscuits). The cooking times are based on cooking the products on a camp stove with adjustable heat and in the best weather conditions. For more detailed cooking instructions on specific products contact us at info@cachelake.com or call 1-800-442-0852. Do I need any special equipment to make your products? No, everything we have can be made in a bowl, pot or a frying pan. Some of the products will need to be mixed in a bowl or pot prior to cooking them. (Fryin’ Pan Breads, Dumplings, etc.) It is helpful when making the breads to be able to adjust the heat on a camp stove. 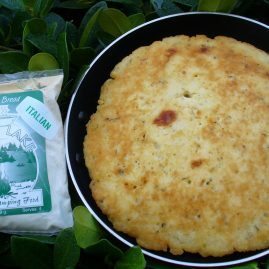 (Fryin’ Pan Breads can be made over an open fire by moving the pan over the coals to cook over medium heat.) A frying pan that deflects heat to its edges is helpful when making any of the breads. How do I find the nutrition information about your products? We have nutritional information available for our products and Outfitter’s Choice. You may also request the information via email or phone call (1-800-442-0852). Adobe acrobat reader is required to view the documents. Get Acrobat Reader. What is the shelf-life/expiration of your products? What is the Overstock Outlet? 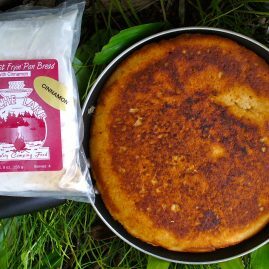 Several years ago the trip outfitters in the BWCAW (Boundary Waters Canoe Area Wilderness) asked if we would consider increasing our product line to include products that they generally carry on their menus. So our Outfitter’s Choice line was born. In order to better serve these outfitters and turn their orders around quickly, we keep an overstock of these products in our inventory. This does create an overstock, which we have decided to pass on to you. Because this is an overstock, not all items may be available at all times. Note: These products are labeled for outfitting, and do not have the nutrition facts listed on the label. This information is available upon request. How can I find a store that sells your products near me? Send us an email at info@cachelake.com or call 800-442-0852 to request this information. Be sure to include the city and state in which you live. We will let you know if there is a current retailer near you. I own a retail store. How do I find out about carrying your foods in my store? Yes. Check out our Bulk Orders page to find out more details. Do you offer a discount to Scouts or Youth Groups? Yes. Check out our Bulk Orders/Discount page to find out more details. I want to do a fundraiser with my Scouts/Youth Group. Can we do so with your products? Yes. Check out our Fundraising section for more details. Can I mail/fax an order to you?